A wet basement can be a costly problem that can cause damage to your foundation, frost push and cracking. It can also create mold issues and even affect the resale of your home. Here are some simple tips with a check list that can prevent and sometimes even cure wet basement issues. Make sure your downspouts are extended properly away from the foundation wall. If they are not, you are directing a large volume of roof water directly next to your foundation wall or into your basement. 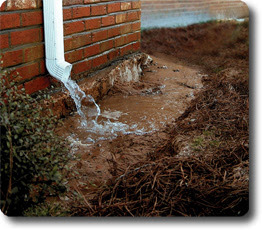 Make sure that your gutter and downspout system is fully connected and not leaking. Check gutters and downspouts for leaves or other debris that can clog the system and cause spillover during a heavy rain. Check the grade along your foundation for low spots and to maintain proper pitch away from your home. Once you have inspected and corrected any gutter and downspout issues, along with your grade, check the operation of your system during a heavy rain. This will show any failures in the system. Occasionally, a system may be undersized to handle the necessary flow. If you have 4″ gutters, you may need to step up to 6″ gutters and downspouts by consulting with a gutter specialist.